Despite the city's approval of a new Sprouts supermarket at the Gill Tract, food activists and urban farmers are teaming up with Cal researchers on another part of the site. Community farmer Allison Moeller works the Gill Tract. The campaign to turn Albany's Gill Tract into a community farm took a hit when the city's Planning and Zoning Commission gave the go-ahead last week to building a Sprouts grocery store, a second retail building, and a senior assisted-living facility on the southern part of the UC Berkeley-owned site. But on the northern section of the Gill Tract, community members — some of whom were forcibly evicted when they camped and attempted to farm there — were recently back on the site growing crops as part of a "community-based participatory research project" led by UC Berkeley Professor Miguel Altieri. And representatives of the UC Berkeley College of Natural Resources have been talking with the community-based Gill Tract Farm Coalition about ways to collaborate there. Cal spokesperson Dan Mogulof said the supermarket development plan for the southern ten acres of the site grew out of "nearly seven years of engagement with the community. It was clear that the community felt an acute need for a high-quality grocery store and an assisted-living facility." The entire Gill Tract is twenty acres in size and is located west of San Pablo Avenue, next to University Village, a housing complex for Cal graduate students. But other members of the community have been struggling for fifteen years to turn the whole Gill Tract into a center for urban agriculture. That struggle reached its most dramatic point in April 2012, when members of a group called Occupy the Farm camped out and farmed in the northern half of the tract for three weeks until they were evicted by UC police. 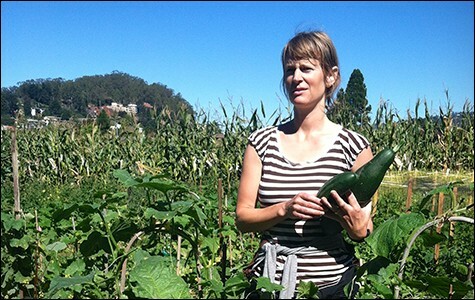 For the rest of the summer, farmers climbed over the fence to water the crops, and ended up harvesting several tons of food, which they distributed free to East Bay residents. The Gill Tract "is some of the best soil in the East Bay," said Occupy the Farm spokesperson Lesley Haddock, a Cal student. "If it was used for food production, it could serve people all over the East Bay, people who don't have access to clean, non-GMO food." A Gill Tract farm could also boost local food production by allowing people to research effective practices and train urban gardeners. That would help reduce climate change by cutting down on the shipping of food over long distances. Both Mogulof and Sprouts Communications Manager Lauren Rosenblum pointed out that the southern part of the tract has not been used for farming for more than seventy years. Some project supporters say the area's previous use as a site for army barracks ruined the soil. But members of Occupy the Farm began a soil remediation project in that area last May — before police removed them. "We did extensive testing of the soil for contaminants," said Effie Rawlings, who worked on the project. "The soil was good, but a few patches where there had been buildings needed a little extra love." Long before Occupy the Farm, some Gill Tract neighbors had been fighting the proposed development, which originally included a Whole Foods store until Whole Foods backed out in 2012 in the face of delays and opposition. "I thought it was outrageous — on or adjacent to agricultural land, to bring in corporate natural food trucked halfway across the country," said Albany resident Ed Fields, a retired UC Berkeley electrical engineer. Fields and other neighbors also objected to other parts of the plan: the 11,000 cars a day the store would draw; the construction of "high-end," rather than affordable housing; and the removal of at least 80 mature trees, including an endangered Torrey pine. "We challenged every [environmental impact review], challenged the zoning," said Jackie Hermes-Fletcher, a retired teacher and master gardener. "We fought really hard. We worked with Berkeley students, we got supporters elected to the [Albany] City Council, we got the school district to pass a resolution." Two lawsuits challenged the project; one is still on appeal. Farmland supporters also opposed bringing in Sprouts to replace Whole Foods. They sent an open letter to the company but received no response. A few months ago, said Haddock, "we escalated, with a BoycottSprouts.com website, social media, and a petition," as well as two flash-mob actions in suburban Sprouts stores. After two hours of impassioned public testimony on December 11, mostly by farm advocates but also from some neighbors who supported the project, the planning commission approved the proposal. Now, only an appeal to the city council, which approved the plan in 2011, could block it. Meanwhile, on the northern ten acres of the tract, the clash between community farmers and the university has evolved into cooperation. Several months after Occupy the Farm first entered the site in April 2012, UC Berkeley dean Keith Gilless announced that the university had transferred control of the Gill Tract from the university's capital projects department, which includes the real estate office, to the College of Natural Resources. Representatives of the college have been meeting regularly with the Gill Tract Farm Coalition, which includes Occupy the Farm, the Albany Farm Alliance, and urban farming organizations from Castro Valley to Richmond. Sarah Hake, director of the Plant Gene Expression Center, whose lab uses part of the tract to grow corn for its research, said that despite early fears, Occupy the Farm never interfered with her use of the site. And researcher Altieri, a supporter of Occupy the Farm from the beginning, set up his cooperative research project to "create bridges" between the university and the community. Since Occupy the Farm began, Altieri has argued that community farmers and scientists could cooperate on the site. In his recent research project, teams of farmers from the community, along with UC Berkeley and Merritt College students, competed to see which combinations of crops and farming methods would produce the most food. Altieri said urban agriculture has the potential to "make a huge difference in solving food security problems in low-income neighborhoods of the East Bay" and help curb climate change. He pointed to Cuba, where highly productive urban farms grow 30 percent of the vegetables consumed in big cities. The Bay Area, he said, imports 3,000 tons of food a day — "food that travels an average distance of 1,000 miles." Increasing local production "would really reduce that environmental impact," he added. Altieri said he is now planning another research project "to assess the productivity potential of urban farms in the Bay Area, figure out what limits productivity," then collaborate with members of the community to develop strategies for growing more. The idea is then to build a network of farmers to share successful methods. Another team of researchers at the College of Natural Resources is planning a separate project to develop 1.5 acres of the Gill Tract as a farm that would serve as a research and education laboratory for urban farming, in collaboration with community organizations. The project will include youth education and employment, training for farmers, and research on farming methods and policy issues. Both these projects will be part of the new Berkeley Food Institute, an interdepartmental program that shares the urban farmers' goals: fostering a global transition from an "industrialized, consolidated, homogenized" food system to agriculture that is sustainable, diverse, and just. Community farmers and the university are still working out the terms of their collaboration. It remains to be seen how far the university will go toward supporting the Gill Tract Farm Coalition's goal of sharing project management. 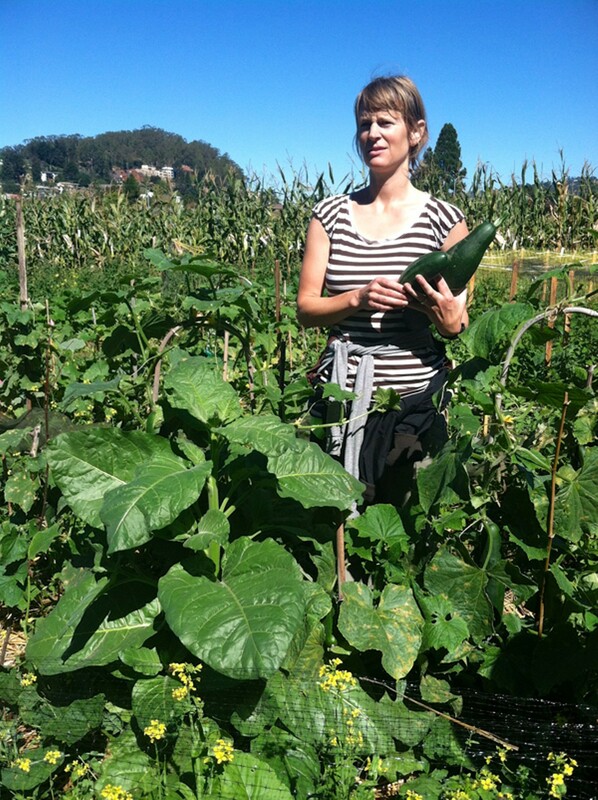 Occupy the Farm still wants to farm the parts of the Gill Tract not used by researchers. And since university bulldozers plowed into the plants, seeds, and fertilizer laid down by Occupy the Farm last May, the relationship has already come a long way. Correction: The original version of this story misstated the year in which Occupy the Farm camped out and farmed the Gill Tract. It was 2012 -- not 2013.